If you’re not regularly and effectively communicating with your tribe, it’s likely that you are missing out on impacting those whom you are meant to serve. Are your blog posts hitting the mark or falling short? We can help you assess your current plan, help you tweak it (or overhaul it completely), and ensure you’re reaching your ideal clients, authentically. Maybe you dream of writing a book, but the entire process feels completely overwhelming — so you don’t ever begin. We love working with writers, coaching them as they grow into authors. Our 5-Step Process applies common sense to your work. It isn’t black-box magic, but rather a thoughtful analysis that you’ll understand. Honest, straightforward, and with your best interests in mind. Plus, it’s informed by decades of experience. Working with Debby on her BlogBuster Virtual Blogging Day was a joy and so productive. I used to blog regularly with one of my earlier businesses but had got out of the habit and to be honest was struggling. It was no longer a pleasure and so often it didn’t get done. I knew that Debby would be able to help but I wasn’t prepared for what a lovely experience it would be and how many blog titles I would come away with. I ended up with 60, enough to do one and week for the year plus and Debby made it seem so effortless. The whole day went in a flash and I am loving blogging again and I especially love the fact that they are planned so when my writing day comes it’s so easy. 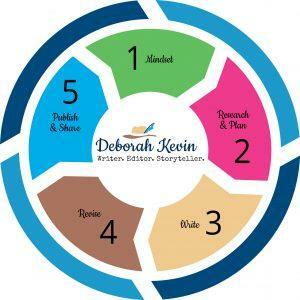 If you are stuck or not enjoying your blogging I can highly recommend Debby to get you out of that rut.